Being sexually abused by a member of a trusted community such as a priest or clergy member, or in a foster home, is devastating on many levels. Most victims are traumatized throughout their lives and must undergo significant therapy to assist in managing their day-to-day lives. Unfortunately, many victims are not able to confront their abusers until they are much older and realize the affects of the abuse. If you suffered physical or sexual abuse, you need an experienced NYC sexual abuse lawyer who can assert your rights against an abuser and the church that did nothing to stop the abuse. Contact an experienced New York City clergy abuse attorney today for an initial consultation and evaluation of your case. At The Orlow Firm, we will aggressively pursue claims against your abuser as well as any other parties or organizations that concealed the abuse. Any third parties who neglected to protect you may also be liable for concealing the abuse or failing to act. 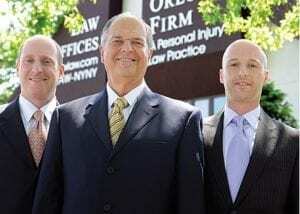 Our attorneys are sensitive in addressing the issues of our clients. We will handle your case professionally and discreetly. In speaking with our trusted attorneys, you can feel safe in disclosing the harms of your abuse. Your case will be handled with dignity and respect for your family and immediate circumstances. For professional and effective legal service regarding physical, sexual and clergy abuse, please contact our firm. We have represented clients in Brooklyn, Queens, NYC, Manhattan, and throughout New York for over 25 years.